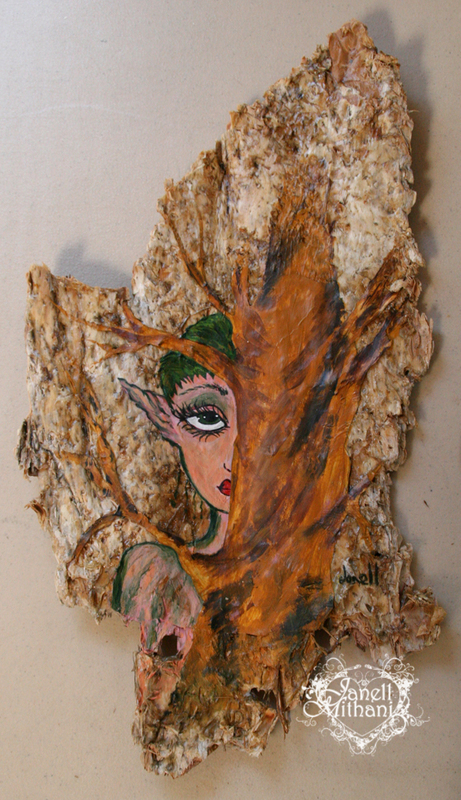 I love painting tree fairies and I have been experimenting with painting them on the bark of the Australian paper bark, Melaleuca quinquenervia trees. We have a lot of them here in Southern California. 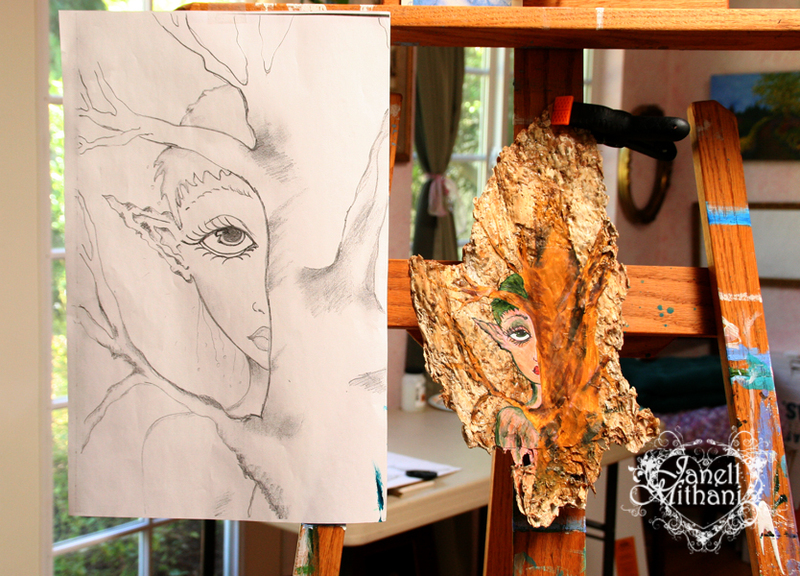 I love the organic shapes and the textures and feel painting on a natural piece of bark fits with my art. The paper-like bark peels right off of the trees and it doesn’t hurt the tree to harvest the bark. This is an ancient art tradition of the Aboriginal people of Australia. They created wonderful dot paintings, often times telling the stories of their dreams. I found out about this style of art a few years ago when I was researching the art of different countries to teach in my art workshops for teens. It is still a popular art style, and I found many beautiful paintings on the internet. It has also become one of my most popular summer workshops. I posted the sketch of my tree fairy a few weeks ago. The tree bark can be really smooth on the back side, but I really liked the front side of this piece of bark. 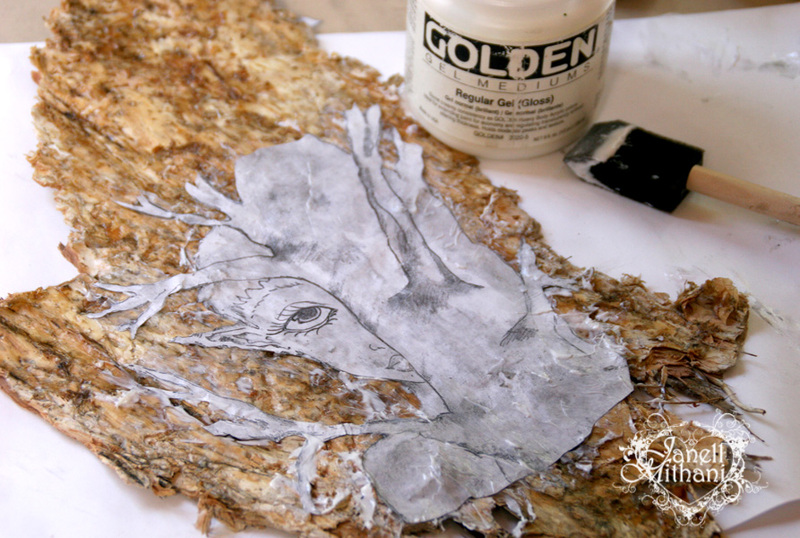 Since it had a lot of texture, I decided to re-create my sketch to size, cut it out, and glue it to the bark as a beginning for the painting. I also applied a coat of gel to seal and smooth out the bark. I attached the bark to my easel with a clip and began painting. I love the light in this picture. I have a wonderful south-facing skylight that lights my easel over my left shoulder. It was my husbands idea when we built the studio and I just love it. Here is a picture of the piece against my wood floor. I wanted to see different colors behind it. Now I need to figure out how to present and frame it. Hmmm…. 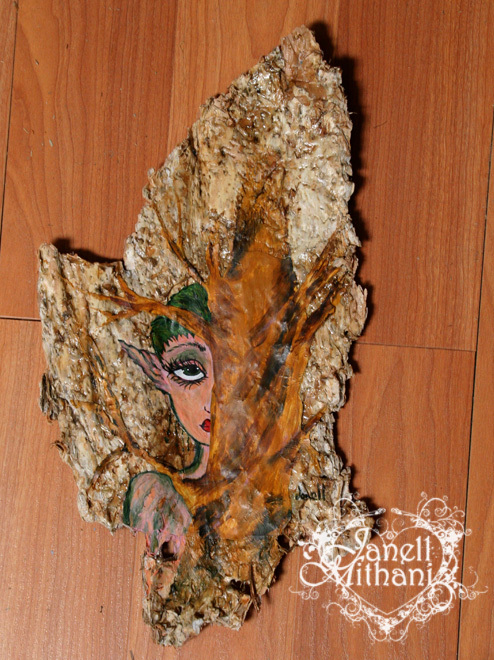 This entry was posted in Art, Janell's Artwork and tagged Australian Paper Bark Tree, bark, fairy, painting, tree. Bookmark the permalink. Really cool! What a perfect way to paint a tree fairy! I wouldn’t frame it; I would just use something like E6000 to glue one of those tabs with a hole in it on the back. Or depending on how thick the bark is and how strong, you could screw in two little O-rings and put piano wire between them. Eva, thanks so much. And that style of frame sounds great. Wow Janell seriously good! Your creativity is amazing – love how you incorporated the texture into the painting, or the other way around, and animated the piece. This is fantastic! Susan, that is a great idea. So simple. I will be hanging it in a public gallery exhibit and they are requiring me to frame it with glass. But I like your idea, so I am thinking I will also put a hanger on the back as you suggested, so it can be hung by itself after the show. I like the idea of having two different ways of hanging the piece, too. Thanks! I have never seen this, what a beautiful, natural effect it has. Love it! Thanks! I enjoyed reading your blog. This is the first time I see the Australian paper bark. It is a very interesting texture. Your idea of putting together this material and your fairy painting is really wonderful. And the result is amazing! Thanks Michelle. I really enjoyed painting on the tree bark and hope to get time to do another one, soon. Thanks for the comment and I am loving all your jewelry tutorials on your blog. Your creations are beautiful! Thanks, the eucalyptus bark should work great. Paint it first with some gel medium or clear gesso to “prime” the bark. That way the paints won’t just sink into the bark and bleed. Be sure to share your results, I’d love to see it!